Dr. Zhang is the first person to ever receive the Giuseppe Inghilleri Award, which is to be presented only once every four years to a nominee who has significantly enhanced the applications of photogrammetry, remote sensing, or spatial information sciences in the four years preceding the ISPRS congress. 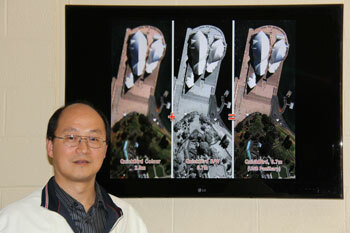 Dr. Zhang received the award for his important work in image fusion and automated pan-sharpening to improve the resolution of colour satellite imagery. He was recently featured in a Natural Sciences and Engineering Research Council of Canada video, "NSERC Presents 2 Minutes with Yun Zhang."